I have been lax. I’ve seen several things, some plays, some dance programs (of a sort), some….well, here they are. You decide how to label them. The season opener at TFANA in Brooklyn, the Peter Brook/Marie-Hélène Estienne (with the C.I.C.T./Théâtre des Bouffes du Nord) production called “Valley of Astonishment” continued to dramatize Mr. Brook’s fascination with what he calls the “labyrinth of the brain.” He previously explored this onstage a number of years ago in The Man Who based on Dr. Oliver Sacks’ book of the longer name The Man Who Mistook His Wife For a Hat. Marcello Magni, Kathryn Hunter, and Jared McNeill. Interestingly, despite the lack of a light or sound cue to make us all hush, the audience fell silent and still just before the actors and musicians entered the performance space — as if there had been a signal only dogs could hear that all the people should shut up and pay attention. 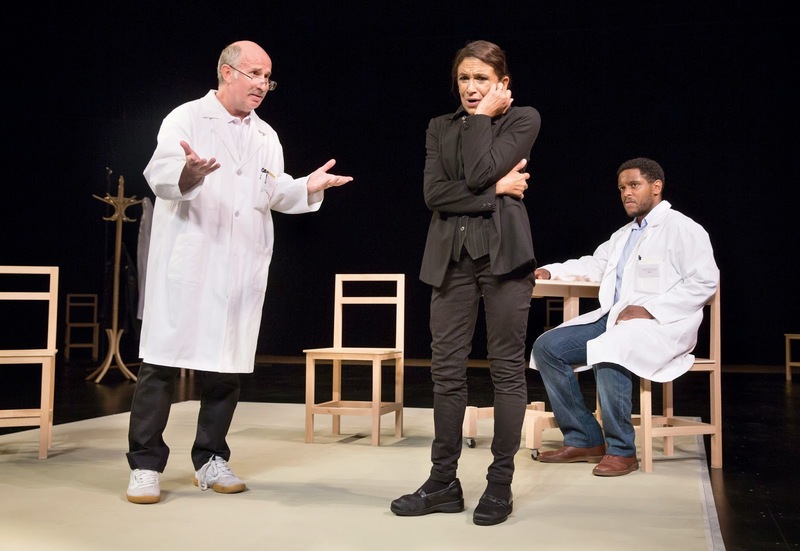 In this theatrical study, Kathryn Hunter, Marcello Magni and Jared McNeill played various doctors, a newspaper editor, a newspaper reporter who didn’t need a notebook (Ms. Hunter as a mnemonist), an emcee, a painter with synesthesia who loved and painted jazz (Mr. McNeill), a one-armed magician (I didn’t really get what that one was doing in there but for the comic relief when he brought audience members up to participate in card tricks) and a man who could only move his limbs when he could see them (Mr. Magni). The performances were uniformly excellent, three actors inhabiting different characters in seamless transitions. Ms. Hunter switched from a confident doctor to the mnenomist who could remember anything effortlessly, but this power bit back just as powerfully. The set was remarkably sparse, as was the lighting. Portions of the 12th century Persian poem The Conference of the Birds were recited in performance and cited in the program as an influence, but I didn’t get the connection even after I leafed through the gorgeous 2011 rendition of the epic poem with beautiful artwork by Peter Sis (who acknowledged the influence on him of Dr. Sacks and Mr. Brooks at the end of his illustrated book — synchronicity). I still didn’t get it, but any excuse to explore Mr. Sis’ world is a good one. As with The Man Who, I wouldn’t quite call this a play so much as a contemplation with dramatizations to aid our search for understanding of receptors that are incomprehensible to the majority of us who do not receive numbers, letters, or words as colors, shapes or feelings. Nevertheless, Valley of Astonishment was a compelling if sometimes confusing evening. Tom Stoppard wrote a beautiful play back in 1995. I missed it. Thankfully the Roundabout Theatre has brought it back in a gentle and lovely production directed by Carey Perloff. Indian Ink is perfectly structured, presents us the story in the present, to past, to present and back again, with all the disparate parts coming together in an emotionally satisfying experience. Well-drawn characters filled the stage and the mind and drew us into the play beyond the duration of the evening. The main character, Miss Flora Crewe, was so real to me that I looked her up so I could read her controversial poetry; alas, to no avail. Flora Crewe is a marvelous creation of Mr. Stoppard, whose puzzle pieces fit together smoothly yet not predictably. By the end we understand each little throwaway line and reference about “Sasha” and “Eric” and Modigliani (yes, that Modigliani) and what role they played in the lives of these two women, sisters, separated by fifty years and death. Romola Garai as Flora in the past is a worthy partner to the great Rosemary Harris, who plays her surviving sister Eleanor in later life (the present). Mr. Stoppard’s play is finely wrought, details sketched then filled in, shaded, colored, polished — never varnished. Water color and oils and pencil appear onstage and stay in our minds. Quick rough sketches lead to lush Indian paintings. Ms. Garai has joined Ms. Harris in the pantheon of goddesses of the theatre. 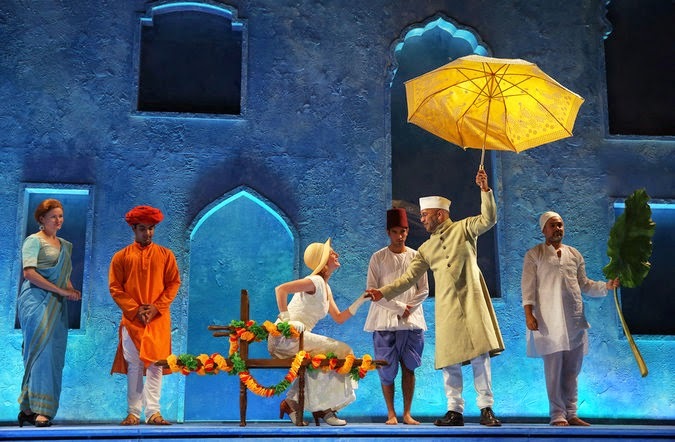 As in all good theatre, everyone and everything is part of the whole, and Ms. Harris and Ms. Garai are much more than ably abetted by Firdous Bamji as Nirad Das, Flora’s portrait painter and so much more, then Bhavesh Patel as Anish Das, the son who goes to meet sister Eleanor in the present. A large and marvelous cast was expertly directed by Carey Perloff in a beautiful set by Neil Patel dressed in costumes to die for by Candice Donnelly. The gorgeous set by Neil Patel. Photo Credit: Joan Marcus. The play only runs through November 30, 2014. This one is worth your time and money, so get your ticket(s) now. Big Dance Theater returned to BAM with a mash-up of three screenplays from different times, styles, and genres: Terms of Endearment, Doctor Zhivago, and the French film Le Cercle Rouge. Annie B. Parson playfully rewrote screenplays and directed her company with long-time theatrical partner Paul Lazar. The company members spoke different roles in gender-bending repetitious rehashings, some of the scenes immediately recognizable since they’re embedded in our sub-conscious memories. The production utilized “multi-media,” meaning a long wall covered in window blinds was cleverly transformed into a screen at the back of the stage to display oddly cut, snipped and sliced scenes of the French film. In Ms. Parson’s revised script, the onstage cast responded and spoke for the actors frozen on the stuttering screen. This chopped salad was jagged and odd. While entertaining for a while, it eventually pushed the director’s conceit a little too far and a little too long. If you have been reading this blog over the past year, you likely know that I had seen Shakespeare’s (Tragedie? Historie?) King Lear three times already in 2014: In Brooklyn, TFANA’s production directed by Arin Arbus and starring Michael Pennington as Lear, then a live broadcast from London of the National Theatre’s Sam Mendes production starring Simon Russell Beale, and finally the Delacorte’s summer production barely directed by Daniel Sullivan. Why a fourth, you ask? Because Shakespeare’s Globe is in town. Since 2009, I have enjoyed the Shakespeare’s Globe touring company — which is not quite the same as the star-company that played a double bill on Broadway last winter. The touring company tours the world, is small and compact like its set. Previously I’ve seen them set up their figurative tent at the Michael Schimmel Center for the Arts at Pace University in lower Manhattan, but this year they’ve come up to Greenwich Village to play in NYU’s Skirball Center. This is the company that presented the only production of Shakespeare’s early play Love’s Labour’s Lost that I have ever liked [http://www.mollyismusing.blogspot.com/2009/12/delightful-dalliance.html] as well as a brisk Hamlet a few years later [http://mollyismusing.blogspot.com/2012/10/a-wee-hamlet.html]. Having toured a bit and put up traveling sets on disparate stages myself, I’d love to see how this company’s set is put together and struck. As explained by Professor Michael Hattaway before the performance the night I attended this production, “booth” sets travel anywhere and can be put on a stage, in a courtyard, at a fair, indoors, outdoors, anywhere. This company is like the traveling players Hamlet wished to join (don’t we all) and they did not disappoint. The Globe Lear was a speeding bullet; unusually this production packed laughs and music and a jig into its three hours before I noticed the time flying by. As I asked over two years ago at their production of Hamlet, was this jolly evening’s entertainment King Lear? I don’t know now any more than I did when that short and amusing Hamlet played downtown, but I’m not altogether sure I care. Judicious and wild doubling highlighted the mad skills of the cast, who played all manner of musical instruments in addition to their own voices — drums, concertina, trombone, guitar, bells, planks of wood, and anything that they could lay their hands on. 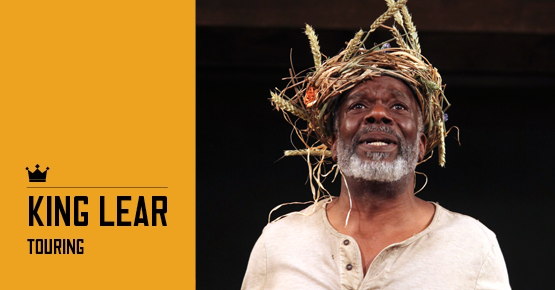 All except the mighty, regal, fretful, warm and childish King Lear of Joseph Marcell doubled other roles. A cast of eight — yes, eight — played everyone. Gwendolen Chatfield played Goneril, various servants and soldiers, and musical instruments, Shanaya Rafaat played Regan as well as various servants and soldiers, even Bill Nash doubled not only the obvious Earl of Kent and “Caius,” but other servants of various lords. John Stahl as the Duke of Gloucester doubled as the Duke of Albany and the rest of the roles appear to have been played by the actors portraying Edmund and Edgar. Their doubling was just hilarious: Daniel Pirrie played Edmund as well as Goneril’s servant Oswald and the King of France, and the servant to the Duke of Cornwall who strikes the fatal blow to Cornwall and is killed by Regan. Alex Mugnaioni played Edgar and the Duke of Cornwall and the Duke of Burgundy. This allowed the two brothers to fight with one another three times! Wild. Mr. Mugnaioni took his Edgar on a journey from a foppish young man to a desperate one to the powerful potential king. Nicely done. Finally, Cordelia doubled as the Fool and Bethan Cullinane was splendid in both roles. Yes, you heard it here first: I loved this performance of a natural, straightforward and still soft Cordelia, neither simp nor sap but a strong confident young woman. That Cordelia and the Fool do not appear onstage together lends credence to the idea that Lear refers to Cordelia when he says “And my poor fool is hang’d” in his final scene — meaning his dear daughter, not his jester, “fool” being a term of endearment at the time, not a disparagement. Ms. Cullinane’s Fool was witty, brave, frightened — a youthful fool, but one that pleased me more than young fools generally do. Bill Buckhurst directed this delightful cast through to the final jig by choreographer Georgina Lamb, all on the compact and multi-purposed “booth set” designed by Jonathan Fensom (which looked an awful lot like — and probably was — the one used in the Globe’s Hamlet performed two years ago. 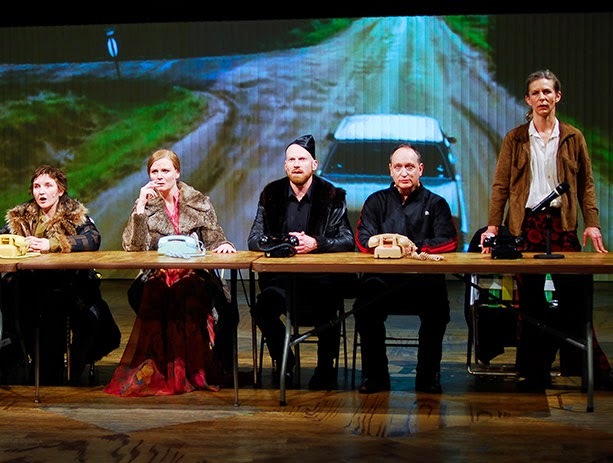 The cast interacted with the audience before the play began and would probably have been happier with their “booth” set on a thrust performance space than on a proscenium stage, but these actors could have done this production absolutely anywhere. 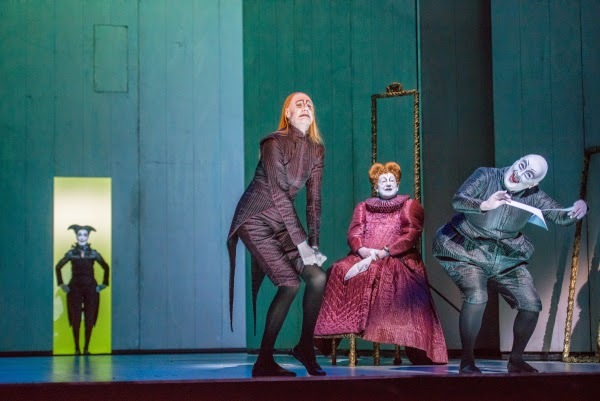 I realize, of course, that the depths of “tragedie” are not plumbed in a production such as this, but I saw three other Lears this year, so that just didn’t concern me. The Globe Shakespeare provided an entertaining, funny, musical, theatrical evening. This company is welcome back to NYC any time, anywhere. The Hamlet set -- looks the same to me. Photo credit: F. Stop Fitzgerald. Unfortunately this play’s NYC run ended on the 12th October, but check Globe Shakespeare’s web site to see if it’s coming your way. Robert Wilson & Rufus Wainwright’s presentation of “Shakespeare’s Sonnets” with the Berliner Ensemble — or, more accurately titled “Circus From Hell” — took over the stage of the Opera House and transformed it into a torture chamber for the audience at whom lights as bright as halogen high beams were shot throughout the evening. Several years ago I sat in that same Opera House when a choreographer, having decided that dawn should be enacted in real time, forgot that theatre is not reality and that many of us have already noticed that the sunrise is not, happily, instantaneous. Back then, the stage and theatre were dark for a wasted 20 minutes. At the Opera House this time, Mr. Wilson decided he had to do dawn one better by providing 7 minutes of crickets and early morning birdsong, very gradually rising in volume. Then the most godawful light you could imagine, which bore no resemblance to a warm and gentle dawn, came up as footlights across the length of the stage. This was a repeated effect for Mr. Wilson, who apparently had decided to blind us with his…intellect? Wit? Neither. A woman dressed in colorless hues and a jester hat entered, giggled, and recited a sonnet. Number 43. She was rather charming, and I had hope, especially if they would turn off that light. But then the truth revealed itself. This was a circus, with masked characters I’d seen in nightmares speaking disconnected lines from the same sonnet. 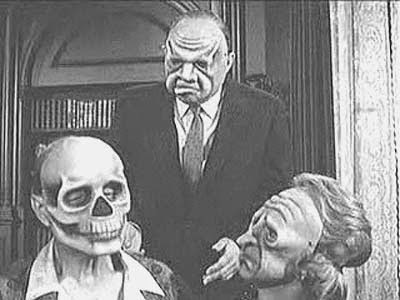 One sonnet over the course of twenty minutes and various “clowns” who looked like those characters in the Twilight Zone episode in which the greedy heirs became their horror masks. Remember this? Well, that was what it was like. No wonder it took three hours to do 25 sonnets. Oh, and since this was the Berliner Ensemble, the Sonnets were spoken in German with English supertitles. I’ve seen several of the plays in several languages, and they work just fine. The Sonnets, however, need to be spoken in their native tongue, which would make the inappropriateness of Mr. Wilson’s vision perfectly clear. Mr. Wainwright’s music, on the other hand, would fit another, radically different, performance of the Sonnets and I hope that occasion does arise to salvage his compositions in various musical styles. Last week, BAM’s Harvey presented three one-act, one-actor plays by Samuel Beckett, all performed by Lisa Dwan as directed by Walter Asmus. The brief evening was very dark in every sense of the word. I’ve never experienced such a dark theatre — even the exit lights were dimmed, there were no lights on the stairs or in the aisles, and the ushers stood close together by the curtains to shield the auditorium from the slightest glimmer of light leaking in. Ms. Dwan did not quite “appear” in the first play — only her mouth was lit in the totally darkened theatre. In the second play, we could see her dimly in the pale, tightly contained lighting. Ms. Dwan paced (creating “Footfalls”), then stopped. Paced then stopped. This went on, silent but for her footfalls, for a while, until her face lifted into the light as she spoke to her mother, and her mother responded. That, too, was Ms. Dwan, in a totally different, deeper, ragged voice of an elderly woman. We could barely see Ms. Dwan’s mouth move when she spoke as the mother. Her work was truly impressive. In the third play, darkness still reigned, with a narrow focused light on Ms. Dwan’s hands and face and the occasional glitter of something on her bodice as she slowly rocked to a repetitious monologue. Lisa Dwan in Rockaby. Photo Sara Krulwich. This was pure Beckett, and I’d guess (without being a Beckett scholar) that Ms. Dwan was utterly loyal to his wishes (despite the fact that her dress in the second play did not appear “ragged” in the soft light, which I believe was his stage direction). 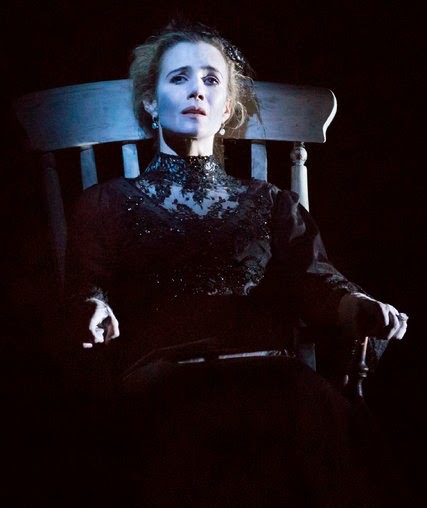 While I admired Ms. Dwan’s mellifluous voice and her vocal technique, as well as the musicality of Mr. Beckett’s plays, still I was unmoved by this evening of theatre. Perhaps that was because the theatre’s darkness combined with the script’s rhythmic repetitions mesmerized me toward somnolence — as if Messrs. Beckett and Asmus and Ms. Dwan wished to push their audience toward nightmares…. I’d be glad to see the talented and highly disciplined Ms. Dwan’s work again with more light, visual and emotional. ~ Molly Matera, signing off, closing her eyes to replay the good and erase the bad…..